notes - holds information collection from Contact by sales people. The contact table contains basic customer information including names, company addresses, project information, etc. The notes table is used to store all sales activity information such as meetings and phone calls. The users table holds login information about users of the system such as usernames and passwords. Users can also have roles, either Sales or Manager. All other tables are simple lookup tables to join to the aforementioned three main relational database tables. todo_desc - description of a task such as Follow Up Email, Phone Call, and Conference etc. A database schema is the structure that represents the logical view (tables, views, primary and foreign keys) of the entire database. A database schema includes entities and the relationship among them. It is a good practice to have one primary key for each table in a relational database. A primary key is a unique identifier for each record. It can be the social security number (SSN), vehicle identification number (VIN), or simply auto-increment number (a unique number that is generated when a new record is inserted into a table). 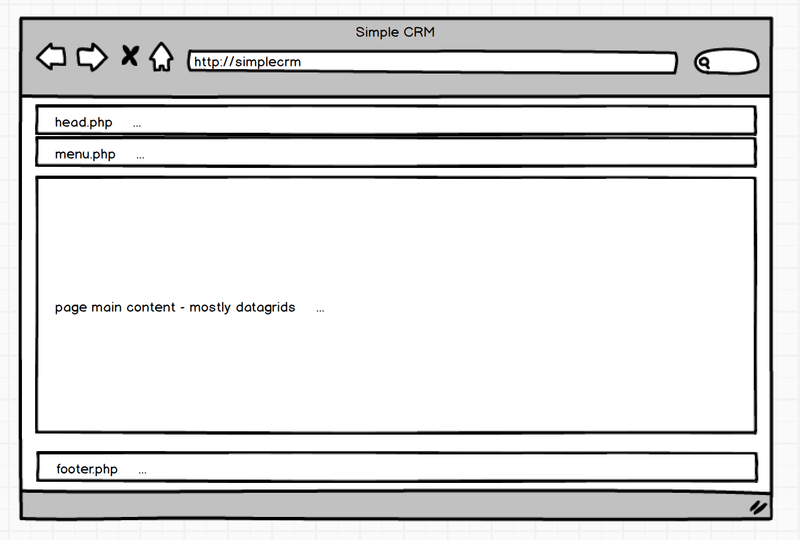 Below is the database diagram of our simple CRM. The key symbol in each table represents the table primary key. The magnifying glass indicates foreign key linking another table in the database. Sometimes we call it the "lookup" table. Once you have an understanding of the database table structure, find the `install.sql` script in the db folder and use a MySQL tool such as MySQL Workbench or Sequel Pro to run the SQL script. 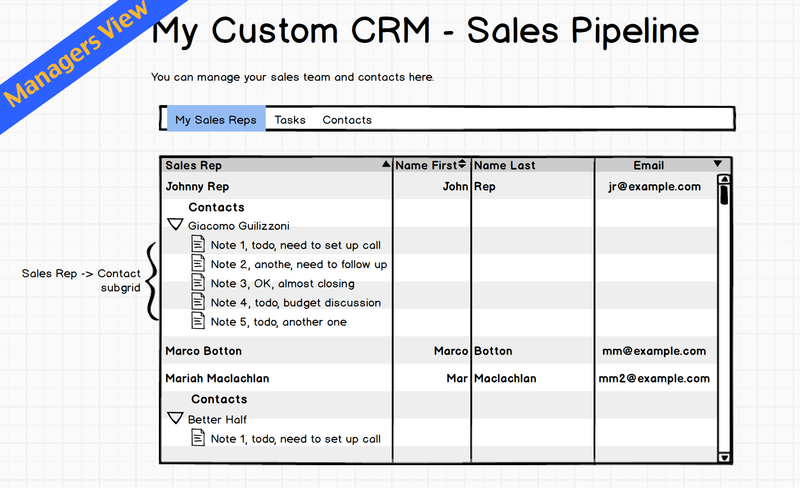 It should create a new relational database named custom_crm and its database tables. Our simple CRM contains many datagrids. The datagrid is a spreadsheet-like data table that displays rows and columns representing records and fields from the database table. The datagrid gives the end-user ability to read and write to database tables on a web page. We opt-in a datagrid tool from phpGrid to create the datagrid. The reason to use a tool instead of building them from scratch is that developing the datagrid is usually extremely tedious and error-prone. The datagrid library will handle all internal database CRUD (Create, Remove, Update, and Delete) operations for us with better and faster results with little code. Before we can start building our first page of the CRM, it is a good practice to make the page items reusable such as header and footer. The page will be comprised of a header, menu, body and footer. We will start by creating a reusable page template. This is a basic HTML5 template header. It includes a link to a custom stylesheet that will be created in a later step. Notice the usage of $_GET['currentPage']. Each page will set a value which will highlight the name of the current page on the top menu bar. Include the following code in `style.css` for menu styling. It will transform the above, unordered list into a menu. This is the complete page template. The main content will go after Section Title. Are you still with me? Good! We can now finally develop the first page in our CRM. Each page indicates a different stage in a typical sales cycle. 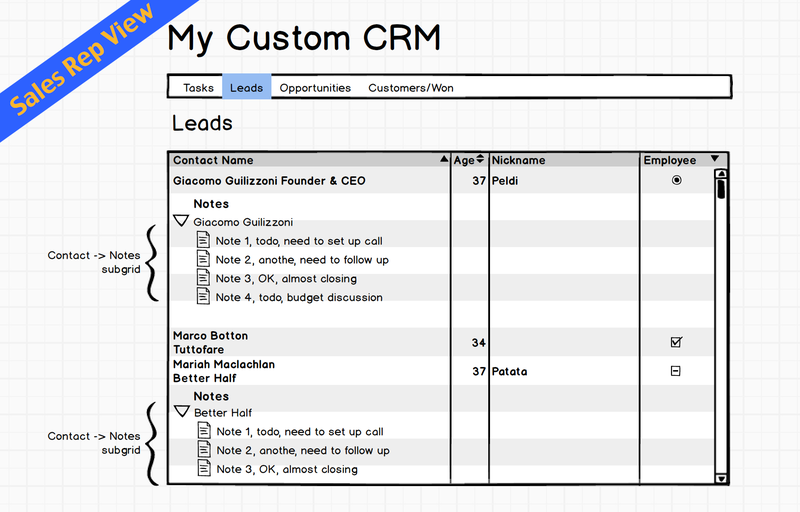 Here's our CRM design mockup for the sales people. When a sales team member logged in, the first page he sees is a list of current tasks. As you may recall, our notes table holds all the sales activity information. 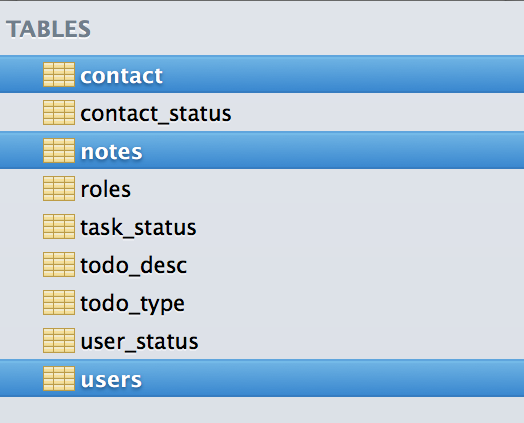 We can create a datagrid and populate it from the Notes table using phpGrid. The Tasks page main content is a datagrid. The following two lines will give us a list of tasks of the current sales person. The first line creates a phpGrid object by passing the SELECT SQL statement, its primary key - ID, and then the name of the database table - notes. The second and the final line calls display() function to render the datagrid on the screen. Check out the basic datagrid demo for more detail. The leads page contains list of current leads that the sales person is responsible for. Each Lead can have one or many Notes. We will use the phpGrid subgrid feature for that. 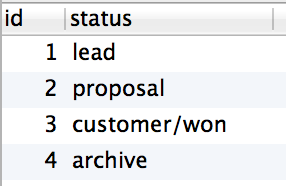 We also need to use set_query_filter() to display only the leads, Status = 1, and only for the current sales person. A Lead becomes an Opportunity once it is qualified. The Opportunities page is similar to the Leads page. The only difference is the filtered status code in set_query_filter is Status = 2. Customers/Won has the Status = 3. Similar to Leads and Opportunities, Customers/Won can also have Notes. That's all there is to it for sales people in our simple CRM. The sales manager will have access to all records in the sales pipeline as well as the ability to manage sales team and customer data. Managers Dashboard has three menu items. Each menu item represents a table in the CRM database. $_GET['gn'] will store the table name. It dynamically generates the datagrid based on table name passed. Since a sales manager needs to quickly find out whom a sale person is working with, we added a detail grid $sdg populated from contact table and link with the parent grid. sales_rep is the connecting key in contact table to the id that is the foreign key in users table. Remember the users stores all of our sales people information. 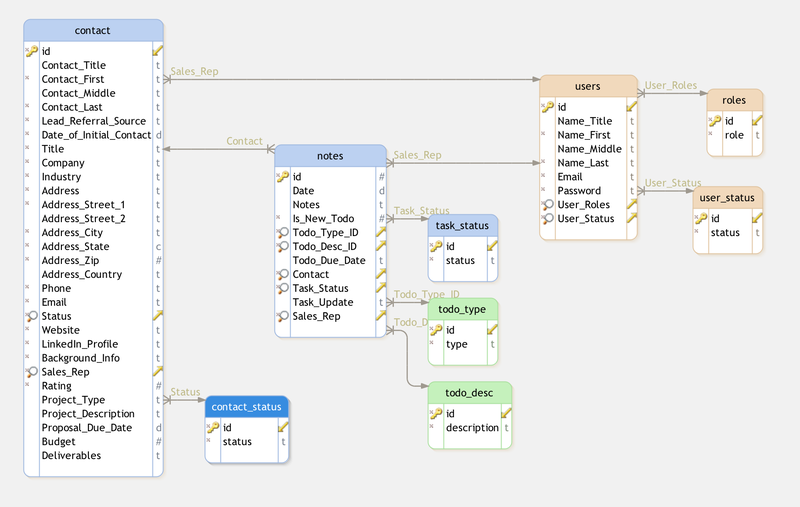 What app did you use to create the database diagram? I use Visio and it seems to get worse with each revision. Great article! Thank you! The database diagram was created with DBSchema from dbschema.com. It’s awesome! … I don’t know, man. Building PHP applications without a structured framework like Symfony or Laravel or whatever now feels just wrong to me. I could bear not having an ORM, but we’ve learnt the hard way that mixing HTML and PHP statements in the same file – de facto using PHP as a template enging – easily leads to the messiest of spaghetti code. Moreover, if we’re teaching beginners, I’d suggest them to use PHP 7 right from the start. Also, PSR-0 as a coding style is widely adopted in the PHP community. I’m not a fan of dogmatic CSs, but for PHP I’d stick to it. I appreciate your feedback. CRM is not a simple system to implement to begin. However, the tutorial is purposely kept as simple as possible for beginners. It can certainly be integrated with a framework such as Laravel or CodeIgniter. It’s not so hard. For future tutorials, like Part II, it’s something definitely can be explored. I agree. There’s not much of a usecase for PHP applications without at least a framework like Slim backing it anymore, let alone PHP apps without a templating engine like Twig or Blade supporting it. You have to create the database first I figured out. While this is a nice tutorial, phpGrid with CRUD editing support is now locked behind phpGrid PRO. While I believe you can complete the tutorial (comment out use phpGrid\C_DataGrid; if you are on PHP 7) it would be nice to show people how to do it with jqgrid for PHP (since phpGrid is a wrapper for jqgrid). Great observation. Unfortunately, that wont’ be a “beginners” guide. The purpose of this tutorial is to easily create a CRM without readers dragging their feet in the inner workings of jqGrid. It will only overwhelm and lost them with the nitty gritty details. It shouldn’t be something developers need to worry about at this stage. It can be better explained in the future tutorials. I’m getting errors on every menu tasks,leads,opportunities,customers/won. may i also ask which line do you edit the phpGrid database? PS. i’m new to this. Looks like it’s missing the php datagrid library. You can get the free library here and then extract the file to folder phpGrid_Lite. Be sure to setup phpGrid database information.